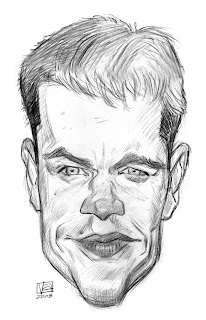 Matt Damon is the subject of Master Caricaturist Jan Opdebeeck's monthly contest on the NCN forum. 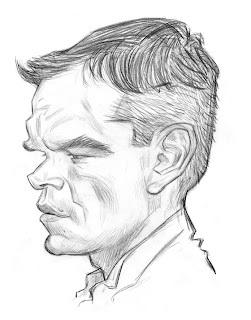 I had tried to do one of him awhile ago but wasn't really happy with the results...so I'm glad to have the opportunity to give him another go! 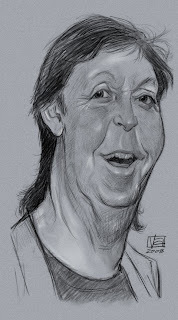 *Updated with a profile...tried to stretch the likeness a bit more! 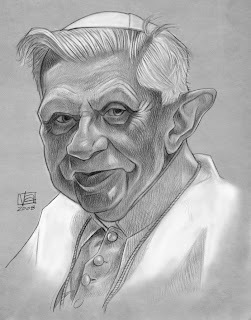 Sketched Pope Benedict prior to the papal visit...I'm sure we're all in store for 24 hour coverage! !...and if that's not enough you can always go to the Pope's Blog (a discovery made while searching for reference)...the Pope has a blog, amazing!! !